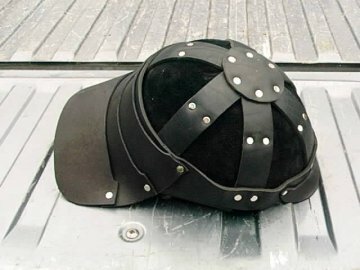 Ilaria's page on how to construct medival looking riding helmets. 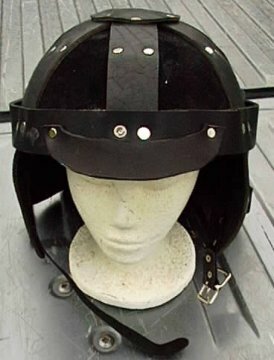 This page is to inspire you to cover your safety helmet in a way that looks period. Riding helmets are not required for adults in AnTir, so I have used various bicycle helmets as some of the examples. The principle is the same. 1. 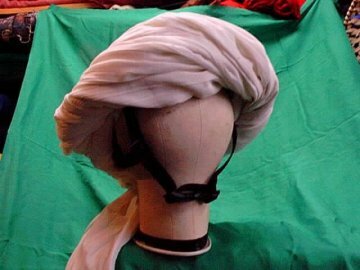 How to cover a helmet to look like a turban. 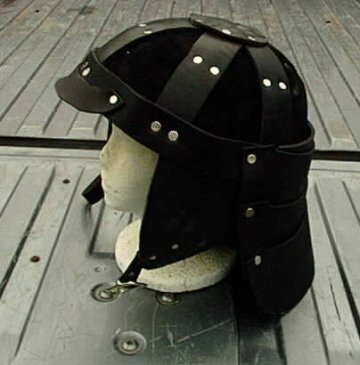 Starting with your choice of helmet, cover it with a layer or two of thick fabric. Flannel or twill will do. You are aiming to cover up the lumps and bumps. I use hot glue. If you want to use white glue or another kind of glue, go right ahead, but the whole process will be slower. 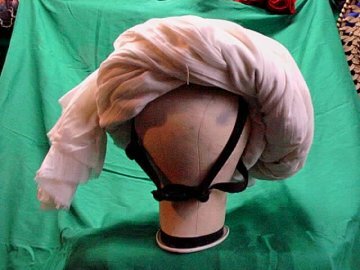 If you want a removeable turban, make a "cap" of the heavy fabric, either by cutting and sewing one to fit your helmet or by glueing the creases in the fabric on the outside to make one. I recommend a heavy woven fabric, not slinky or stretchy material. 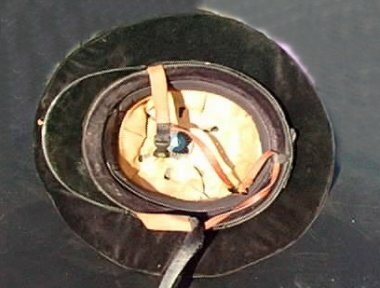 Tuck the ends inside and either glue them in place(permanent) or velcro them(removeable) so they cover the edges of the helmet. 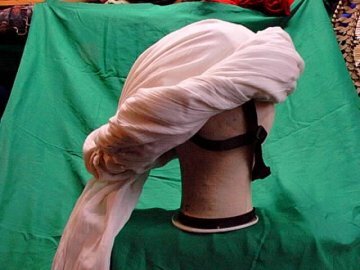 You will need a minimum of 2 yards and perhaps more, depending on how many times you want to go around the turban with twisted wraps and how much of a "tail" you want to leave hanging. Choose a thinish soft fabric for your "turban". Cotton gauze is good. Anything woven and a bit stretchy will work. 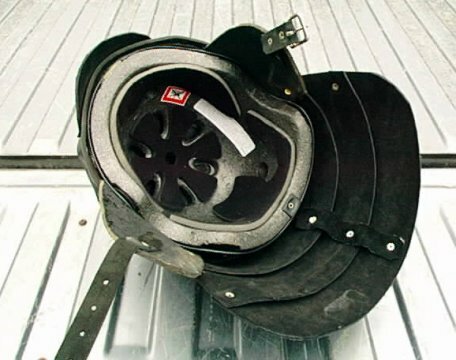 Cover the whole helmet with a single layer or two, and make sure the edges of the fabric are well under the edges of the helmet and near the edges of the "cap" on the helmet and glue. Then start twisting. Wrap the twist around the edge and glue into place. Use lots of glue as you want it to stay stuck where you put it. 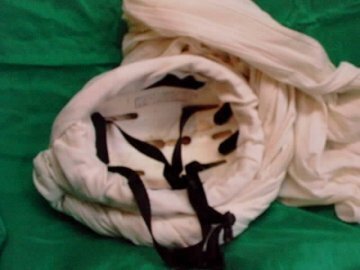 You can use the end of the fabric to wrap over the top, or around your neck to cover the chinstrap,(or if you wear a face mask for dust as I often do, you can cover your face) or let it hang. 2. How to cover your helmet to look like a helmet! 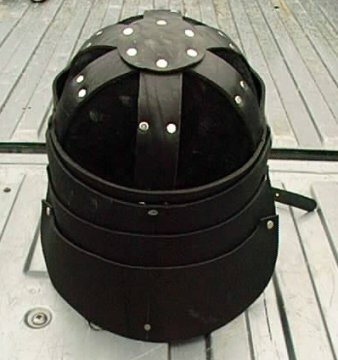 This helmet was made using the patterns in the Armour Archives, by Master Togrul Guiscard of AnTir. 3. 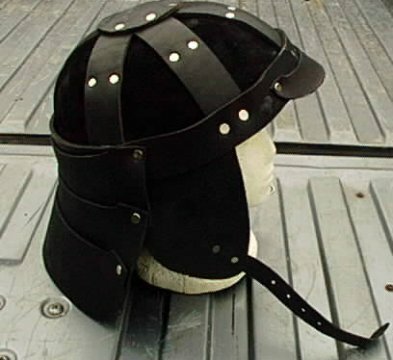 How to cover a helmet to look like an Elizabethan Tall Hat. 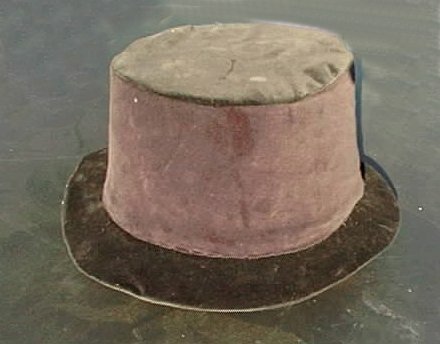 This hat requires some millinery experience. This is not hard to do but I am not prepared to teach it to you here! See these websites for a start on millinery information. A quick search online will turn up many more.